Here are some drawings that were needed sooner than later on this wild, out of control picture. I felt so bad for everyone at Santa Barbara, Blue Sky, and Hunter Gratsner, who had a daily change in scale and ship direction!!! These drawings were quickly put together to remedy the problem, but they did little to no good to help any of the visual effects folks trying to get their shots and hard work to have a consistency. I saw many of the FX crew blasting out of the building, screaming and running naked out into the surf only to be devoured by the sea and never to be seen again. If you all will remove your hats and give a moment of silence for those lost in the line of VFX duty,,,,,,,,, daaaaaaaa, da, daa! I didn’t realise the Holoship was that large! Wow, the scenes in the movie didn’t convey how large that Holoship really was! Yeah they had a holo-village in there, but you could fit a sizeable piece of city in there with no problem! Also, the Enterprise looked a fair bit smaller when it rushed along the side of the collector. Wow the hollowship is massive. I am with the others. I really thought it was a lot smaller than that. I’ve always loved the sona ships. Would love to see some more of those if you get some time. Very nice work! Thanx for sharing! I love scale sketches. Thanks! I love scale sketches (and starship comparsion charts) too! Those scale charts are quite cool to look at – especially considering the Ent-E is one of my favorite starships. Are there higher resolution versions available? I have to scan them so yes I will get some larger images of these for you!!! What they’ve all said! Great to see the scale sheets, in particular for me the Holoship Scale Sheet, but I can’t enlarge it and make it out so higher res would be nice. I think both the yacht and Sona ships are nice to look at, but these sketches made me appreciate them more. Now I have the the urge to watch it again and check out these ships in more detail. I keep looking for something I can have a negative opinion on, but it’s a rare thing on this blog! The shuttles are usually my favourite ships in Trek, so it was great to have three brand new ones in this movie. Looks like some artistic license was taken with the scale of the Ent and the Son’a collector when it exploded at the end, but that made for a pretty cool shot (although it didn’t feel entirely like something from a Star Trek movie, I must admit). That was when everyone started running to the Sea!!! This is when all the scales and directions went haywire!!! Best sentence of the blog so far. Moving on, thanks to Mr. Eaves for posting these cool drawings, but my eyes aren’t quite up to the challenge of picking out the little length numbers for the holoship, shuttle, and scout! Can anyone help me out with this? Thanks in advance! I’ll fix this tiny image problem for you!!! Scale is nice. It’s cool nowadays, as you can build everything in CG “life-size” and then mesh are all to proper scale to each other. However, you do have to know what that size is going into building and painting. Although, I have heard tell the when you make a world too big, some CG programs can go a bit wonky. The Blue Sky you mention… is that the same upstate NY studio that brings us the Ice Age films and Horton Hears A Who (among others)? If so, I didn’t know they were into doing space VFX. If so cool, I’ll send ’em me reel, eh. I think the West coast branch closed and they are only in NY now!!! That is if they were in fact connected! Ya know, the yacht, esp. it’s side profile, kinda reminds me a touch of the TAS Copernicus shuttlecraft, as seen in TAS: The Slaver Weapon. Any conscious influence there, John? you have the eye,,,, I’ll go and check this one out!!! BTW, do you have a larger/higher-rez version of the orthos of the yacht? I’ll scan all of these from the originals and and also the ones that are not here so you can have a better view. I’ll scan these bigger for you!!! The yacht is coming so I’ll be sure to get you what yer need-n! Wow, I knew those Son’a ships were huge but that battleship scale image says it all. Thanks for sharing these, I love Insurrection (though, truth be told, I love all Star Trek. ;)) I remember seeing those Son’a ships on the screen in the theater and thinking that the Enterprise was overmatched, but we never really got a good image of just how much larger they were until now. Fortuately, Riker “rarely uses conventional tactics” ~ Data. yeah the “E” was quite out sized but Riker was flying so not much of a match for a bunch of face lifted Aqua Velva’s!!! john eaves: I’ll scan all of these from the originals and and also the ones that are not here so you can have a better view. john eaves: you have the eye,,,, I’ll go and check this one out!!! Here’s a link, but you’ll have to copy and paste it into your browser as Bernd understandably doesn’t allow hyper-linking off his site. Absolutely amazing! can’t wait to see more. Granted, It’s not a HUGE similarity, the side profile just reminded me of it a bit, them both being kinda pointy, and the nacelles ridin’ the dorsal edge. 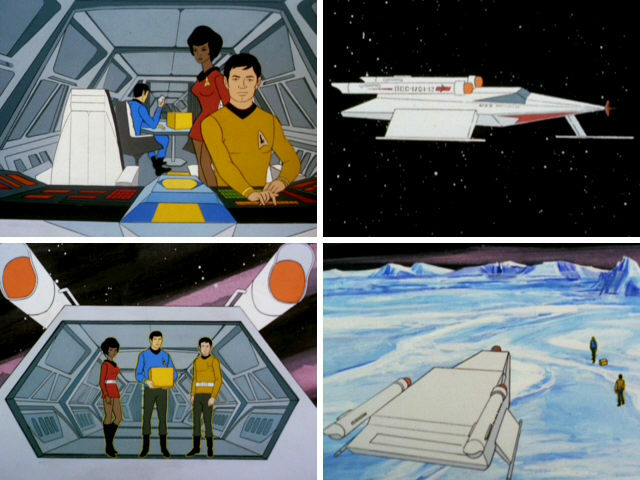 I have to say, I love the nacelles on the yacht and the shuttle – how they are basically the TNG-style nacelles but with the wide part of the blue grille at the back, and streamlined. I always really liked those nacelles in particular, and the ships they were attached to. I remember reading about how you meant for the Son’a command ship to fly the other way but whoever saw the drawing thought it was flying the other way and had you reverse it. I think I liked the way you had it before, too. Were the Son’a ships meant to have been the ships the Ba’ku first came to their world in, and Ru’afo and his minions stole them when they left? It must drive you nuts John, when you see a creation get beautifuly made as a studio model or CGI and then see it get raped during the vfx stage either with bad scaling or bad vfx, like having weapons fire from lifepods after you spent hours tweaking weapon systems on a design or via bad scaling like in Insurrection. I understand the artistic licence comes to play a little bit, like the Enterprise swooping down over the collector in insurrection, or in First Contact having the Enterprise dwarf the Defiant, , it wouldn’t of been as dramatic if the ships were done to scale, but it still must get under your skin! I think those Son’a ships are the coolest alien ships ever created for a Star Trek movie. I would have loved to see much more of these huge battle ships. The only ship in Trek that is as alien as the Son’a is the Breen. If I recall you desgined them as was well John? thanks! that was another collaboration between Doug and I!! Great stuff, but you have a huge amount of blank space under the images before the text of the post making us all have to scroll for a good 2 pages or so. sorry had a technological foul up!!!! Thanks for the size comparisons. I love both the Son’a ships and the Breen vessel, but it is often hard to see details. I’ll see what I can do!!! On an genetically related note…continued blessings for your daughter and the Eaves household. I really liked the look of the Sona ships, especially the battleship. Oh, and just a reminder, as you requested, how about the orthos of the ARCHER? What would the size differential be between the E and that ship? Hope you had a happy Easter! Awesome! The yacht was one of those models that I wish had been given a little more screen time. After 7 years of being told it existed in TNG, we finally got to see it! I suppose something was better than nothing at all! 🙂 I’m curious to know what your inspiration for the Son’a ships was. I thought they were fantastic! Of course, the Official ST Fan Club offered an exclusive, a small model kit of the yacht–all done directly with John ‘s help. A sweet little model. Nice comparos, definitely not the only one to be a bit surprised by scale of things. I have not been able to successfully post to that entry. I guess it is too old or something. Any hoo I have questions regarding those slotted grills on the inset of the saucer and weather or not the yellow glow in the central pit is a shuttle bay or a impulse engine. I was also wondering if you had any other views of this design. Currently modeling it and Im stuck on the nose and underside. In regards to the Holoship, is the scale completely correct? I’m just looking at the bridge at the back which suggests is would be slightly smaller? I’ll have to add to Madkoifish’s comments on another STO design as well, the Donut Science vessel from last month, could you provide a larger image of the plan views of it? I’m not sure if you look back at the older blog entries hence why I ask here.